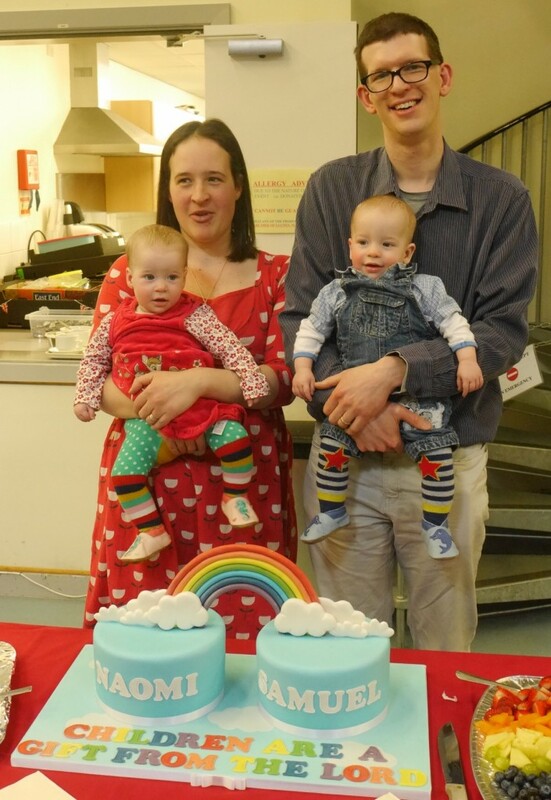 On Sunday we celebrated with family and friends the twins’ dedication at church. This is a bit like a christening, but we chose to have a thanksgiving rather than a baptism, which is the same decision we made for the older boys too. It is a way of thanking God for their safe arrival, praying for their future lives, and giving them a public welcome into the church family. It’s also a great excuse for a family get-together! One day our children can choose themselves to be baptised, if they come to believe in Jesus as their saviour, which of course we pray they do, but ultimately we would like them to be able to make that step on their own. We go to a Church of England (CofE) church here in Birmingham, as we did in the previous cities we have lived in (in fact Tom and I met at church in Nottingham). Traditionally the CofE has baptised infants, but there is also a standard liturgy for a thanksgiving (or dedication) for anyone who would rather do this, and we have known a roughly similar number of parents our age who go to the same CofE churches as us choose each one. My parents went to a Baptist church when I was a child, and the tradition there is to baptise adults (or at least older children who have decided themselves) and dedicate babies; I really appreciated the opportunity to have a believer’s baptism as a teenager, to consciously experience the act of water washing away my sin. Tom was baptised as a baby, and then decided to publicly commit to his belief in Jesus at his confirmation as a young adult – this is what has traditionally been done in the CofE for those who were baptised as babies and who want to declare their faith as adults, though it’s not a second baptism involving any water. He too has no issue with what had been decided on his behalf as a baby, because he has come to the same conclusion on his own. So with one positive experience each, this didn’t help us in our decision as to which to have for our own children: an infant baptism or dedication. It’s not a decision we came to quickly. We thought and prayed for quite a while before we went down this route with Andrew. We looked into the theological arguments for and against infant baptism, and really didn’t have a sense of which was the “correct” interpretation of the Bible. We spoke to the vicar of the church we went to at the time, and to friends who had decided on either baptism or dedication. In the end we decided that God is far bigger than any of the decisions we make as His children, so even if the CofE have got it “right” and the Baptists have got it “wrong”, we don’t believe this matters to God, and He knows our intentions and thought processes in this decision. Although we have both found ourselves at home in CofE churches for the past 20 years or so, that’s not to say we consider ourselves strictly in that denomination. Primarily we are Christians, with a relationship with Jesus Christ, and the individual church we choose to go to at any given time reflects how we best interact with God via the worship there, not simply because the church belongs to a particular group with particular traditions. The CofE itself has a huge range of worship styles within it anyway, as we have seen from our past few churches that have been right for us in different ways at different times and stages of our lives. The twins’ dedication was particularly meaningful for us since they were born after we lost a previous baby to miscarriage. Not that we weren’t thankful for the older boys, but having experienced pregnancy loss before the twins were born, this made us appreciate the preciousness of new life that comes from God all the more so this time. I wrote a blog post not long after the miscarriage about children being a gift from God. I didn’t know at that point if we would be blessed with a rainbow baby (or even two!) but this was very much on my mind as we set a date and prepared for this celebration of the twins’ birth. 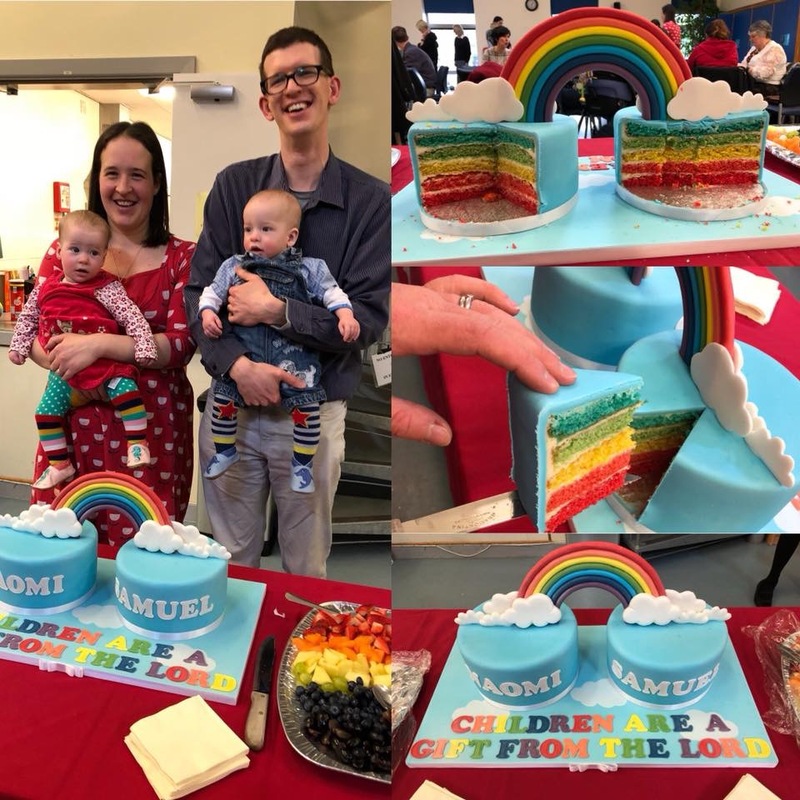 The cake, which my mum sorted out, captured this wonderfully in its text and rainbow features. Although the day was a celebration for us, we also heard at the end of the church service some tragic news about the sudden death of a toddler related to a couple of members of the congregation. It is really hard to make sense of such a devastating situation. It was not long ago that I met the toddler at church when she played in the crèche room with her parents as I sat feeding the twins. This kind of tragic event could happen to any family. As I prayed for them later in the day, I felt that hearing this news on a day that we were celebrating life was a reminder of the transience and fragility of life, and that makes me even more thankful for each and every day I get to spend with our gifts of children.